The Upside is a remake of the French film The Intouchables, which is in turn based on the memoirs of Philippe Pozzo di Borgo and Abdel Sellou, a wealthy quadriplegic Frenchman and the man who would become his caregiver. The film stars Kevin Hart, Bryan Cranston and Nicole Kidman, and premiered this weekend. This isn’t the kind of movie that would typically get my attention, but the trailer was funny, and I was impressed with the small but talented main cast. The Upside is directed by Neil Burger and also features Julianna Margulies, Tate Donovan, and many more. It takes some liberties with the source material, most obviously setting the story in New York rather than France; that being said, I haven’t read either of the men’s books or seen The Intouchables, so I don’t know just how different the details are. Given this, much like I did with Green Book, I’ll be judging The Upside solely as art and entertainment, rather than how accurate it is to the true story or how it compares to the first film. 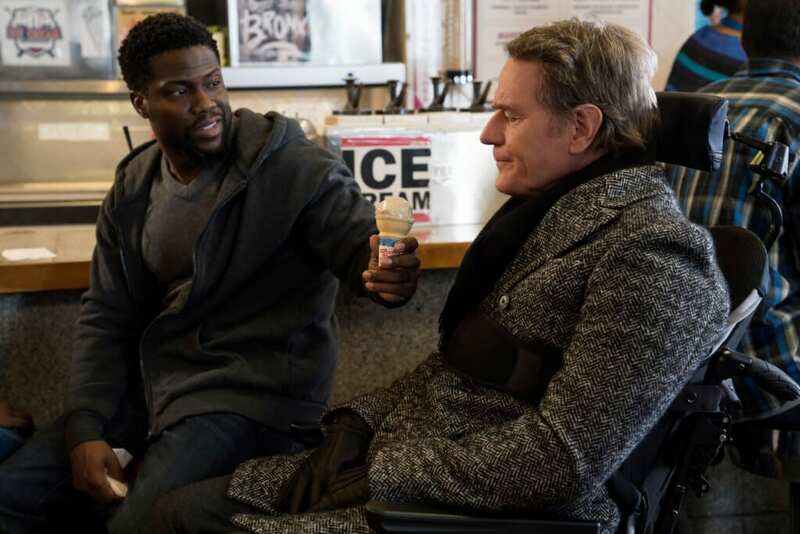 The Upside opens with Dell (Kevin Hart) driving Philip (Bryan Cranston) speedily around town, to the enjoyment of both. The two narrowly avoid legal repercussions, and the film cuts to six months earlier: a fresh-out-of-prison Dell is homeless and estranged from his wife and son, while Philip is depressed and seeking a new life auxiliary. As the film explains, a life auxiliary is a caretaker for Philip to be his arms and legs. Dell applies for the position in an attempt to simply procure a signature proving that he’s seeking work to appease his parole officer. However, desperation and rejection from his family push Dell to accept the challenging job. Naturally, Dell and Philip get to know more about one another, their respective pasts and tragedies and become good friends. Can their friendship survive in spite of their wildly different backgrounds and the mistakes in Dell’s past? The acting in The Upside is good, but probably not the best you’ve seen. The actors portray their characters believably and are quite likable, but I feel like these are the kind of understated performances that will fly under the radar. This is actually my favorite Kevin Hart performance I’ve seen for that very reason; Dell delivers some one-liners and the like throughout the movie, but overall Hart shows a lot of restraint here. I haven’t seen a lot of his work, but compared to something like Jumanji, this is a totally different side of the actor. Bryan Cranston also does very well, communicating lots of information just with facial expressions. His line delivery is on point, particularly when he’s being funny, but his quiet, introspective moments are some of the best. Nicole Kidman doesn’t have as much to do, but her character is interesting, and she expresses her emotions believably. I really like all the performances, and I like how restrained they are. A movie like this can so easily become sappy or over-the-top, and they never quite go there, which I tend to appreciate. The original score by Rob Simonsen is very understated, and to be honest, I rarely noticed it at all. When I try to think about the music from The Upside, all that comes to mind are Aretha Franklin and Philip’s (eventually successful) attempts to get Dell into opera music. This isn’t a huge loss, as there was plenty in the film to keep my interest, but I love film scores and consider the music a big part of the experience. The movie looks good for the most part, and the aerial shots during the paragliding sequences are pleasant. The editing in the last 45 minutes or so started to get on my nerves; they do that thing where they have a montage of clips from the scene at the beginning to remind you of what happened. This is, frankly, boring, and I feel like they could have just shown Dell and Philip in the car and the audience would understand that the story had caught up to the earlier scene. Montages can be used effectively, but I don’t like it when the same information is communicated twice, and this is the wrong way/reason to use one. The very final scene also felt rather abrupt to me, and I actually looked at my husband and said “…is that the end? That’s it?” Not that it’s a bad scene or anything; the shot just cuts to (again) a visual reference to something that took place earlier in the film. Again, as with the musical score, this isn’t the worst thing ever and by no means does it ruin the movie. It just feels like, at key points in the second half of the film, editor Naomi Geraghty didn’t quite know how to connect one scene to another. The actual ending doesn’t even feel like an ending, and if you’ve seen it, you’ll know what I mean. Another aspect of The Upside that didn’t quite work for me is a conflict between Dell and Philip later in the story. There’s actually a pretty big betrayal of trust early on that I thought would be the film’s central conflict, and it’s a betrayal against Dell’s son as well as Philip. However, once the truth is out, very little is made of it. The two friends do end up having a falling out, but it’s over something else that makes absolutely no sense. It goes pretty far, too, to the extent that Philip becomes more depressed than ever and adopts some disturbing behaviors. Within the story, it doesn’t add up, and it doesn’t feel authentic to the characters and their friendship up to that point. Again, it feels like the filmmakers just didn’t know what to do, so to maintain the story’s momentum they create this big, soap-opera-like disagreement between the two over something that seems pretty irrelevant to their friendship and Dell’s employment. In addition, near the beginning of the film, they make a big deal about Philip having a DNR (do not resuscitate) order because he no longer wants to live. He states this to Dell, and Dell continues to reference it both comedically and in earnest. It almost feels like this might come back or be the source of conflict, but after about midway through the film, it’s never referenced again. There were two huge possibilities to create interesting conflict staring the writers in the face, and it feels like they ignored both and chose something ridiculous to send Philip spiraling into depression. I consider most of my complaints with The Upside to be relatively minor, but this one is pretty huge because it took me out of the story and didn’t feel authentic to the two leads and their established relationship. That being said, I really did enjoy this film. The Upside is funny, emotional and thoughtful, and best of all, it never goes over the top or gets too sappy. Some of the technical aspects are less than impressive, and I have one major issue with the story, but I would still recommend the movie; it was a nice way to spend the afternoon. The acting, particularly the back-and-forth between the two leads, is very good, and there are some genuine laugh-out-loud moments throughout. The Upside isn’t a perfect movie, as very few are. But it is fun and entertaining, and I’d recommend checking it out. The Upside is funny, emotional and thoughtful, and best of all, it never goes over the top or gets too sappy. Some of the technical aspects are less than impressive, and I have one major issue with the story, but I would still recommend the movie; it was a nice way to spend the afternoon. The acting, particularly the back-and-forth between the two leads, is very good, and there are some genuine laugh-out-loud moments throughout.